Heel pain is commonly caused by plantar fasciitis and Achilles tendonitis. These conditions are caused by stress on the tendons. The pain is most intense in the morning after your foot has been at rest all night and slowly fades or dulls. It can feel like stabbing, throbbing or shooting pain in your heels. Common causes of heel pain include a recent increase in activity such as a new sport or weight gain. People who stand on concrete floors or wear dressy shoes or high heels will often experience heel pain. The MLS Laser can eliminate heel pain safely and effectively. The laser stimulates the body to begin healing by increasing the blood flow and oxygen to the heel, plantar fascia. This flood of blood and oxygen will help to reduce pain and inflammation. The laser is forces the body into repair mode which sets off a series of recovery instincts. 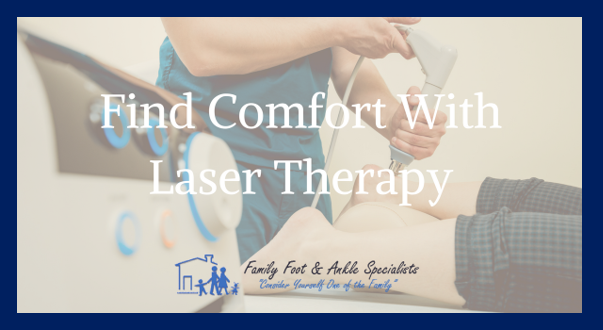 Laser Therapy is quick and painless. We have the laser right in our Piscataway office. A session lasts about 15 minutes in total time from set up to treatment. It's a relaxing and safe treatment. The laser does not get hot or burn skin. Our laser is one of the limited lasers available that actually feels cool. One of our Medical Assistants will aim the laser in the location of pain or injury. For heel pain, you may lay down and allow the laser to hit directly on the heel. The laser rotates in intervals to target the whole heel.